Tony launched Redwagons.com in 1998, selling the classic American childhood toy – the Radio Flyer wagons. He found a good break, and went on to start an online store at Yahoo! from his home, armed only with a keen sense of business acumen. With hardly any capital and no programming skills, Tony was able to grow his online store into a million dollar business in just three years. We were given the privilege to interview Tony Roeder and here are the secrets of his success as a home-based entrepreneur. I absolutely had no Internet experience before that. All I had was an AOL account that I rarely use. As far as the construction of the website was concerned, everything was self-study. 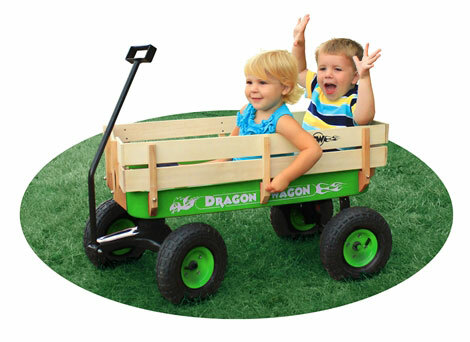 We focused our attention on Radio Flyer Wagons and became an Internet toy store primarily selling their products. How much did you invest in your business? The only investment I had in this company was $4,000, which was spent for a web designer whom we “fired” right before the holiday season of 1998 because the site wasn’t operating, and he was just difficult to work with. At that point, I found Yahoo! and built my site on the Yahoo! Store system. The site went live in early November 1998, after three months of work which begun as early as September. Did you take on other investors? No, there have never been any investors. Profits were plowed back into the operations. I was incubating the site off my handyman business, which was not a large business to start with. I was running my handyman business with 3 or 4 employees. I had a small home office. I ran everything out of my home. I got this online business started with the handyman business serving as its incubator. That’s the reason for the low investment as I already had the infrastructure in place to at least get things started. I also did not take salary for the first year. So that’s how the incubation process worked. So if you ask how much money I invested on the company, I couldn’t say because it was all melded with the other company. That money ($4,000) was just used for the designer whom we ended up not using. What led you to see the potential in this market? I had some friends who were actually doing OK on the Internet. I also had the sense that the Internet was going to go somewhere and I had the feeling that this is a ground floor opportunity that was about to take off. How did your business perform at the start? We are a retailer of Radio Flyer’s wagons. In 1998, Radio Flyer had some experience with larger names that had Internet presence. One of the big ones was QVC.com but they really weren’t moving the inventory that much. They were probably doing maybe 100 or 200 orders a month. We ended up doing over 1,000 orders in the first two months. We took some drastic moves into getting ourselves well positioned on the search engines. We were just well positioned on Yahoo and on some other sites, and from that we got the traffic. It was a guess as to how many people were actually looking for Radio Flyer out there. We also knew that we have the advantage because we have a wide product line whereas most online stores only carry two or three of their products because they’re so large. We’re filling a niche and answering the problem that there was no selection since most stores carry only 2-3% of that selection. The main part of our strategy is that every decision, especially the marketing decisions, has to make fiscal sense upfront. We do not spend any money on speculation. I know that I need a certain return from any type of marketing investment I make. I consider it a loan to our investment, and that if we lose money, it’s never going to be a couple of hundred dollars to maybe a thousand dollars. So when somebody comes in and says, “We’re going to give you a million impressions,” and then they tell you the cost per thousand. I always ask for the rate of return. If they tell me that a good return on that is x, I’ll always double the x and then run the calculations to what my gross profit is. When I double their best projections — that is the only time it will make fiscal sense to me. How do you market your business – offline and online? Our marketing has to make fiscal sense. So I sit with a calculator and say its going to costs us this much to do it, this is the industry standard return, and this is my profit margin, so OK it doesn’t make sense. We do PR stuff, but we don’t hire a PR firm because we never thought there would be a direct return on investment. We do not do banner, but we do email to our existing customers. We feel we have a very good relationship with them because of the good service we’ve given them. We don’t use search engine submission services: we do it ourselves. We’ve looked into some of those services, but then again it’s the calculation. If it’s $50 for incredible submission, we’ll give it a shot. If it’s a thousand dollars, we’ll say thanks but no thanks. Because RedWagons.com has been around for 3 years now, we are top listed in a lot of different sites. For the past two or three years, we just focused on building a business and getting it up and running. Now that we are established and feel that we have the strength to move on. So we’re turning our focus on the direct marketing aspects of the business. We’re neophytes in that area. We approaching it with the same kind of ignorance, confidence and excitement that we undertook the whole venture in the first place. We may do something on it eventually, and if we do it, we will find a low-cost way of doing it. We’re in our second stage right now. We still need to grow our customer base. We need to build the strength of our company. So many online businesses, the greatest examples are Etoys and KBKids, spent millions of dollars on advertising. They spent $50 million on advertising and got $50 million in sales, so at best they had a 1:1 ratio. So when you look at their sales and profits, there’s bound to be a loss. We cannot afford a 1-to-1 basis. How did Yahoo! help you in promoting your site? Yahoo! was great for us. We met at a great time. They were concerned about stores like eToys and Amazon expanding their extensive toy line. And Yahoo wanted to have their shopping portal; but they were shy in the toy area. So they gave us very good exposure up front to come into the store and be part of it. We brought some cache – the Radio Flyer name is a known name. It is a company used and trusted by many generations. My grandfather had a Radio Flyer. My parents had a Radio Flyer. I had a Radio Flyer. My child is to going to have Radio Flyer. How is your online business doing now? We have over 50% of the Radio Flyer market online, even when EToys was still up. We do better than Etoys and Amazon combined, and all the other ones. Our revenues were over a million last year and we’ll be in the mid-$2 million this year. Just through carrying the whole product line. We are proud of the quality of our customer service. How did you fulfill the orders? In 1998, we went live. Our goal then was to get our foot in the door. We had a web site, but we didn’t really have a phone number for the holiday season of 1998. We would download orders off the Internet, convert them into purchase orders, which we would fax to the manufacturer and they would fulfill the order. In 1999, we toyed with the idea of outsourcing. However, we went in-house and we fulfilled out of a 900 sq. foot storefront that we converted into a warehouse. We practiced just-in-time inventory. Trucks would come in the morning; unload all the stuff to go out to the shipping lines. We would then fulfill the orders. Our customer service was at 98% during the peak holiday season of 1999. Where everyone else crashed – where Etoys can’t fulfill, Amazon, ToysRUs where giving $100 certificates for all the orders they didn’t fulfill – we were able to fulfill just about every order. There were about 4 where we had problems, but they were UPS issues. So in 1999, we went the complete opposite of all the big people. They all went and outsourced their fulfillment and they crashed. We in-sourced our fulfillment and we were able to deliver. We shipped out our products the same day if the order was placed before 1:00 p.m. After 1 o’clock, orders go out the next business day. We follow a strict schedule so customers never have to worry about when they can get their purchase. They receive their products 3-4 days after they placed the order. Learn from Tony Roeder, owner of RedWagons.com how a small business can succeed online by finding a niche market.